COLORADO SPRINGS, Colo. - The Sky Sox are one win away from clinching as American Northern Division champions for a second consecutive season after an 8-2 game one victory Friday night in front of a sellout crowd of 8,998 over division rivals, the Oklahoma City Dodgers, at Security Service Field. Oklahoma City struck first in the top of the second to take a 1-0 lead. With two outs, Will Smith drew a walk and starting pitcher Kyle Lobstein supported his cause with a double to left field. In the top of the third, they took a 2-0 advantage after Edwin Rios hit an RBI single to centerfield to plate Donovan Solano who led off the frame with a double. The Sky Sox missed out on scoring opportunities early on in the first and second innings, stranding a pair of runners in each frame. Following the third inning, the contest would only see a total of four base runners as a pitching duel rallied deep into the night. Dodgers Kyle Lobstein finished his night after six shutout frames and allowed just five hits with two walks surrendered and seven strikeouts. 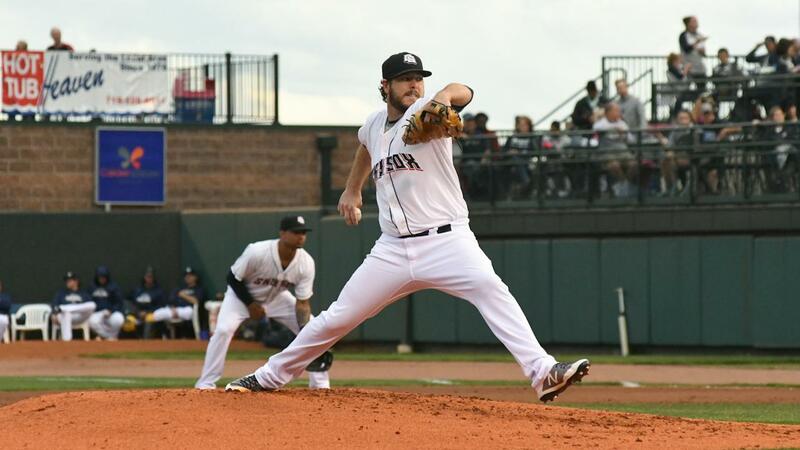 Sky Sox Aaron Wilkerson competed against Lobstein, allowing two runs on four hits over seven frames with five strikeouts. In the bottom of the seventh, offensive support for Wilkerson came to life and Colorado Springs battled back with four late runs to take advantage of the ballgame for the first time. After Julio Urias replaced Lobstein for Oklahoma City, two consecutive walks started the momentum. With one out and Zach McCallister in for Urias, Nate Orf loaded the bases after he was hit by a pitch. Dylan Moore followed up with a single to centerfield just in front of centerfielder Henry Ramos to tie the game at 2-2. From there, a sacrifice fly ball from Tyrone Taylor and a wild pitch plated two additional runs to extend the Sky Sox lead to 4-2. After a quick top of the eighth inning delivered by reliever Mike Zagurski, the Sky Sox went back to work, matching with another four-run frame to take the reigns in the opening contest. Clint Coulter led off with a laser double to right field while Richie Shaffer walked behind him. Following Andres Blanco's bunt groundball single to load the bases, Rymer Liriano singled to plate one. An infield groundout and single by Orf tallied the additional three runs. Right-hander Corey Knebel, in his first appearance for the Sky Sox this season, closed out the ninth unscathed despite allowing a double and a walk in the frame, making it an 8-2 final. The Sky Sox head into a doubleheader against the Oklahoma City Dodgers at home in Security Service Field tomorrow with a 4:00 p.m. MT first pitch in game one. For all information on Sky Sox, follow along on Facebook, Twitter, and Instagram, and visit the team's website at www.skysox.com. Tomorrow's Preview: The Sky Sox head into a doubleheader against the Oklahoma City Dodgers at home in Security Service Field tomorrow with a 4:00 p.m. MT first pitch in game one. Righty Adrian Houser will get the start for Colorado Springs as he is set to face Oklahoma City's righty Brock Stewart. Battle for the American North: The Sky Sox stand only one win shy from clinching their second-consecutive playoff run, battling it out with other contender of the American North - the Oklahoma City Dodgers. Currently, the Sky Sox hold a 2.5-game lead over the Dodgers with four regular season games left in 2018. Last season, the Sky Sox broke one of the longest postseason droughts in professional sports - taking the American North division for the first time and breaking their 20-year absence. Lights out, Wilkerson: Sky Sox starter Aaron Wilkerson made his best start of the season after a solid performance in the series opener: 7.0 IP, 4 H, 2 R, 2 BB, 5 K. It marked his highest inning count in 2018 since his last start (8/26 @ OKC) of six innings. In his last start, also against the Dodgers, he allowed two runs on seven hits in the team's tight 3-1 loss. Back to Yester-Year: Last season, the Sky Sox clinched playoff berth on charter buses en route from New Orleans to Round Rock while Hurricane Harvey was hitting near Houston. Due to Harvey in the area, all flights were cancelled. Playoff Clinch History: A Sky Sox playoff clinch at home would mark the first time in nearly a quarter of a century. The last playoff clinch for the Sky Sox at home happened in 1994 when the team won the first half at home vs. Edmonton. The other two instances at home came in 1990 and 1991. In 1990, the Sky Sox clinched the wildcard playoff berth on last day at home vs. Albuquerque. (Albuquerque won both halves, Sky Sox was wild card team and all five games were played in Albuquerque. Dukes won in five.) In 1991, the Sky Sox clinched their playoff berth, winning second half, at home vs. Tucson during final game. (Lost to Tucson in playoffs in four.) In 1989 (Tucson), 1992 (Tuscon), 1995 (Vancouver), 1997 (Tacoma), and 2017, the Sky Sox clinched while on the road. Record Attendance: Friday night's crowd of 8,998 marks the fifth largest crowd all-time in Sky Sox history, passing the 8,995 from July 4th against New Orleans this season. It is also the largest crowd since the 2006 stadium renovation to the current stadium configuration. Taylor Extends To 11: Outfielder Tyrone Taylor extended his hit streak Friday to 11 games after going 1-for-3. Over the 11 games, he is 17-for-43 with seven runs, two home runs, and 13 RBI. Late Magic: The Sky Sox late rally in the opening game of the series improved the team's record to 9-39 when trailing after six innings. Colorado Springs now total 33 four-run frames overall this season. Nine-Run Second: The nine-run second inning on Thursday night marked only the third time the Sky Sox have allowed nine runs in the second inning, both other instances in Colorado Springs. The last time an opponent scored nine runs in the second inning: Iowa on June 14th, 2016, in game two of a doubleheader, with Iowa winning that game, 15-5. The only other instance came on July 26th, 2008, when the Oklahoma Redhawks scored 11 runs in the top of the 2nd inning at Security Service Field, a game where Oklahoma won, 15-12. It was also only the second time where Omaha scored nine runs or more in any inning against the Sky Sox. The only other instance came on July 29th, 1999, at Sky Sox Stadium, when the Omaha Golden Spikes scored 12 runs in the top of the third inning in game two of a doubleheader. Omaha won that game, 13-11. Omaha was known as the Golden Spikes from 1999-2001. The last time the Sky Sox gave up nine runs in any inning on the road was on July 25th, 2010 when the Salt Lake Bees stung the Sky Sox for a 9-run third inning at Spring Mobile Ballpark in Salt Lake (now Smith's Ballpark), as the Bees beat the Sky Sox, 15-7. Hit By Tim: The two hit by pitches by Tim Dillard in the second inning Thursday night marked his 28th and 29th career hit by pitches with the Sky Sox, extending his own club record. Jason Young was 2nd all-time in hit by pitches with 25. Bubba Bein' Bubba: Bubba Bubba Derby finished a complete-game shutout for the Sky Sox over the Omaha Storm Chasers in game two of Wednesday's doubleheader, allowing no runs on four hits with just one walk while striking out three, marking his first career complete-game shutout. The Bubba Derby 7-inning CG win was the first 7-inning complete game win since the Sky Sox became a Brewers affiliate in 2015. The last Sky Sox pitcher to throw a 7-inning CG win was on August 10th, 2013, when Chris Volstad beat the Nashville Sounds, 6-2, in Game 1 of a double- header at Security Service Field. The last Sky Sox pitcher to throw a 7-inning CG shutout win was on May 7th, 2013, when Tyler Chatwood threw a 9-inning CG shutout win, blanking the Iowa Cubs, 5-0, on four hits, at Security Service Field. Series Summary: Over 16 games accrued over the 2018 season with Omaha, the Sky Sox hold a 12-4 overall record on the Storm Chasers. On the road, Colorado Springs is 6-2, while they compiled a 6-2 record at home. In nine of the 16 meetings, the games have been decided by two runs or less. Pitching By the Numbers: Heading into Tuesday, the Sky Sox team ERA at 4.52 was tied for the fourth best season of Team ERA in franchise history. The 1989 Sky Sox squad (Indians affiliate) also had a 4.52 ERA. Last year's Sky Sox pitching squad finished with a 4.54 ERA. Career Night: Right hander Adrian Houser had a career night on Monday in front of family and friends in his home state of Oklahoma, tossing his best outing of the season with the Sky Sox: 7.0 IP, 0 R, 5 H, 1 BB, 5 K. Offensively, he went 1-for-3 with a double. Good Company: With Christian Bethancourt being selected to the Sky Sox All-PCL team this season, Bethancourt becomes the first Sky Sox catcher to ever get All-PCL team honors. Here is the full list of the Sky Sox All-PCL team over the years: 1988 - Luis Medina (OF), Rod Allen (DH), 1989 - Paul Zuvella (SS), Steve Olin (Relief P), Mike Hargrove (MGR), 1991 - Geronimo Berra (OF), Luis Medina (DH), 1992 - Alvaro Espinoza (SS), Wayne Kirby (OF), Denis Boucher (LHP), Charlie Manuel (MGR), 1994 - Jason Bates (SS), 1995 - Trenidad Hubbard (OF), Harvey Pulliam (DH), 1996 - Neifi Perez (SS), Bob Goughan (Executive), 1997 - Todd Helton (1B), Neifi Perez (SS), 1998 - Derrick White (OF), 1999 - J.R. Phillips (1B), David Wainhouse (Relief P), 2000 - Phil Hyatt (1B), 2003 - Rene Reyes (OF), 2004 - Clint Barmes (SS), Garrett Atkins (3B), 2006 - Jeff Baker (OF), Nate Field (Relief P), 2007 - Joe Koshansky (1B), Ryan Speier (Relief P), 2008 - Joe Koshansky (1B), 2009 - Eric Young, Jr. (2B & PCL Rookie of the Year), Matt Miller (OF), 2012 - Matt McBride (1B), Andrew Brown (OF), 2013 - Ryan Wheeler (3B), Corey Dickerson (OF), 2015 - Domingo Santana (OF), 2016 - Orlando Arcia (SS). Blanco Comes Up Big: Andres Blanco hit a two-run homer in game two against the Dodgers Saturday night for his ninth longball of the season. His two RBI were the only two the Sky Sox offense produced in the game. Seven Straight: The Sky Sox marked their seventh straight win with Friday night's 6-5 victory. It was the Sky Sox' longest winning streak since the 2007 season (May 7-13, 2007). Will To Win: The Sky Sox, who entered Friday night with a 6-37 record when trailing after six innings, improved their record to seven wins with a three-run comeback in the top of the seventh to take a hold the lead for the eventual victory. Third One-Run W: The Sky Sox completed their third one-run victory against the Dodgers this season in Friday night's 6-5 win. The team earned wins on back-to-back occasions on May 12 and May 13 with 2-1 and 4-3 wins respectively. This Week's Preview: The Sky Sox are hosting their divisional rivals, the Oklahoma City Dodgers, as they battle it out in the final five games of the season.